The new Orthman 1tRIPr strip till system distributed through Muddy River Agricultural is helping Queensland grower Wayne Ziesemer significantly improve his operation and save time during the busy planting season. The new Orthman system is built to place fertiliser and prepare the seed bed in a single pass. Wayne runs a 1,500-hectare cropping operation spread across two properties at Bongeen, 55km west of Toowoomba with his wife Leanne and parents, Peter and Daph Ziesemer. His summer cropping operation includes a rotation of 500 hectares of sorghum with 500 hectares of corn or cotton depending on seasonal conditions. His decision to move to the Orthman 1tRIPr six months ago was based on the machine’s ability to combine strip till and nutrient placement at two depths in the one pass. The Orthman 1tRIPr delivers several advantages to growers. Built to perform in heavy stubble with its ability to cut the soil surface and subsurface residue, the strip till system also ensures consistent depth due to its parallel linkages. Conventional till systems can lead to soil compaction due to the higher number of passes required to plough or till the soil prior to fertiliser application. Wayne explains that the machine has been tried and tested in the United States with operators finding it can deliver up to 15 – 20% yield increases. The potential fuel savings from fewer passes appealed to Wayne, as they added to overall profitability. The consistency of the seed bed would also result in good yields. Wayne uses a modified version of the Orthman 1tRIPr strip till machine to meet the varied fertiliser requirements for his irrigated and non-irrigated land. The 18.28m model can fold to 9.14m when working on the irrigated property, which requires smaller equipment due to the heavier soil. This flexibility eliminated the need for Wayne to buy two pieces of equipment. 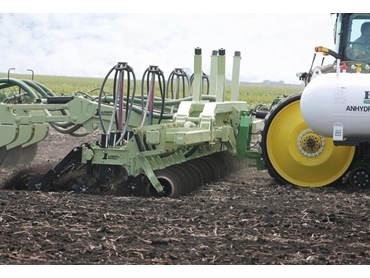 Two one-tonne Anhydrous fertiliser tanks are attached to either side of the tractor during fertilising operations along with a 6,000-litre Simplicity air cart towed by a John Deere 8360RT.